Although you can turn off AMBER alerts and Emergency Alerts, you can not turn off Presidential Alerts. The authority of the President to send such an alert out through the communicative technology of the day was granted back in 1934. 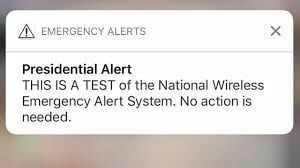 In 2006 a new law allowed wireless carriers to let us all opt out of AMBER and Emergency Alerts, but specifically restricted opting out of Presidential Alerts. The only thing you can do to affect the PA is to put your phone on silence, but unless you plan to keep it on silence forever, this method will only help you save your ears during planned tests since you’ll never know when a real alert will need to be sent through.